Ever since the idea of artificial human beings came to existence in Karel Čapek’s, Rossum’s Universal Robots, mankind has developed a fixation on the idea of rabota – an old Church Slavonic word for servitude, from which the term ‘robot’ was derived – and the world of medicine is no exception. The earliest use of robots began in 1987 with the first laparoscopic cholecystectomy, a procedure where the gallbladder is removed with the assistance of a video camera and thin instruments (2002). Because laparoscopic procedures alleviate the woes of postoperative complications, (i.e. decreased post-op hospital stays, decreased pain, and a quicker return to one’s daily routines), the use of robots has increased exponentially. Fast-forward to today and this paradigm shift is even more prominent. Operation-assisting robots approved by the Food and Drug Administration (FDA) today include ARTEMIS, Prodoc, ROBODOC, Zeus, the AESOP system and, what will be explored more in-depthly in this article, the da Vinci robot. (Lanfranco et al. 2003). 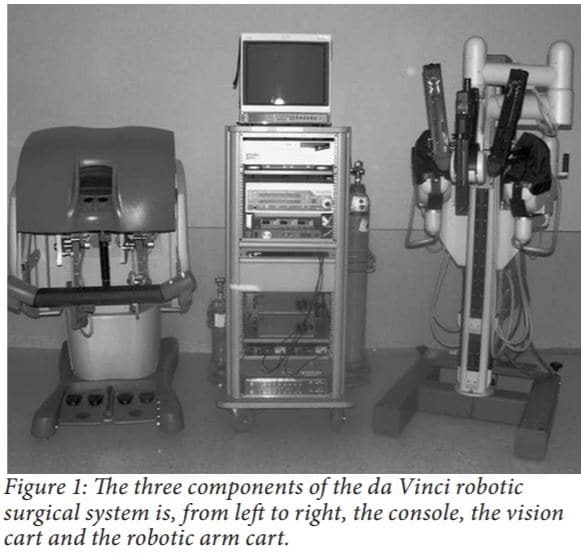 As seen in Figure 1, the da Vinci robot is comprised of three components, a moveable cart with three arms, a console and a vision cart (Bodner et al. 2003). The moveable cart consists of four arms: three arms which can have operating instruments attached to them and a fourth camera arm which produces a 3-D picture that is relayed to the console. The console is the station where the surgeon can operate on a patient remotely with an image-processing computer that creates a 3-D video feed of the operation. This 3-D video can be seen through the viewport of the console, which is above the hands of the surgeon to give the illusion that the surgeon is conducting a traditional procedure. The vision cart is directed towards the site of the procedure and has a dual light source and dual cameras. The moveable cart consists of four arms: three arms, which can have operating instruments attached to them, and a camera arm that produces the 3-D picture. The 3-D feed is relayed back to the surgeon at the console, ultimately producing the illusion of a traditional procedure. Ever since its approval by the FDA in July 2000, the da Vinci system has been used in a multitude of different surgical procedures including: laparoscopic surgeries, mitral valve repairs, radical prostatectomies, GI surgeries, and kidney transplants. In one study that documented 146 patients who underwent surgeries assisted by the da Vinci robot, patient follow-up was evaluated to determine the benefits of this new alternative surgery. Some of the most prominent surgeries the patients in question underwent included antireflux procedures, cholecystectomies, tubal reanastomoses and gastroplastics for obesity (Cadierre and Himpens 2001). Out of all of the patients who were followed up with, none reported any type of robot-related morbidity. 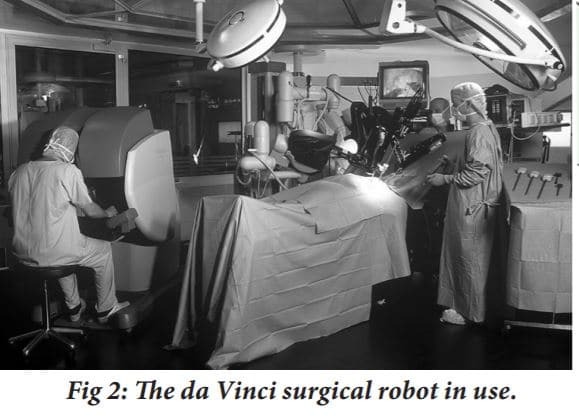 In another more recent study, the feasibility of using the da Vinci robot for thyroid surgery was examined. In this study, 338 patients underwent an endoscopic thyroidectomy using a transaxillary approach (Kang et al. 2009). During a traditional endoscopic thyroidectomy, part or all of the thyroid gland is removed through an incision made in the patient’s neck. 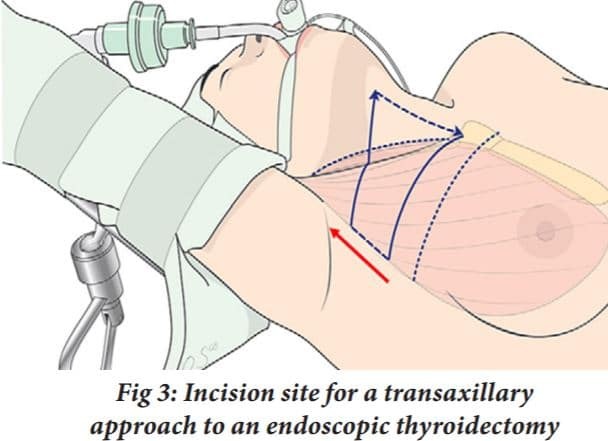 However, the transaxillary approach, as seen in Figure 3, allows for the incision site to be in a more remote location, the underarm of the patient, and another incision site is in the anterior chest. The results of this study were very promising. Out of the 338 patients, the mean operative time for the thyroid surgery itself was 59.1 ± 25.7 minutes with no extreme postoperative complications. What exactly is the difference between traditional, more conservative surgical procedures and surgical procedures conducted with the assistance of robots? Can these robot-assisted surgeries be trusted? Although relatively new and not without disadvantages such as high cost and the absence of the surgeon’s sense of touch, the benefits of robot-assisted surgeries are well-documented and immensely outweigh these disadvantages. One of the great advantages of robot-assisted surgery is that there are fewer post-operative complications. This is a direct result of less invasive procedures as with the adoption of robotic assistance in surgeries, open procedures through larger incisions are no longer necessary. With fewer post-op complications, there are also fewer hospital readmissions. The average hospital stay after surgery has also decreased greatly for post-robotic surgeries. In an expertise where accuracy is key, a huge advantage for using robots in surgery is the elimination of natural, physiological tremors of the surgeon’s hands. What’s Next for Robotic Surgeries? There appears to be no delay in the improvement of this new method in surgery. Although the aforementioned benefits of robotic surgery already make it favorable over traditional surgical methods, scientists are continuing to improve robotic surgery, but how? The da Vinci robot has been used in procedures such as endoscopic thyroidectomy, cholecystectomies, tubal reanastomose, etc., which have all been on organs, accessory organs, and/or vessels, that are all essentially stationary. But what of surgical procedures on body parts that are in constant motion? What of the human heart, whose complications account for the most deaths in the world, 30% of the global death toll in 2008? (Ruszkowski et al. 2015) Cardiovascular disease is the leading cause of death in the world. 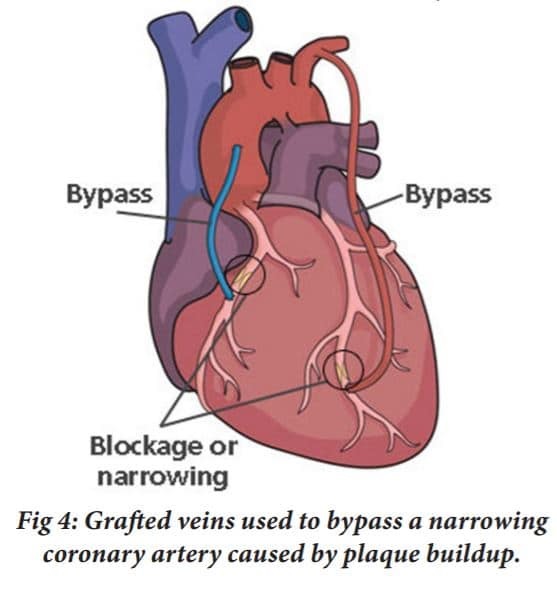 A common type of surgical procedure to treat for cardiovascular diseases is coronary artery bypass graft surgery (CABG). 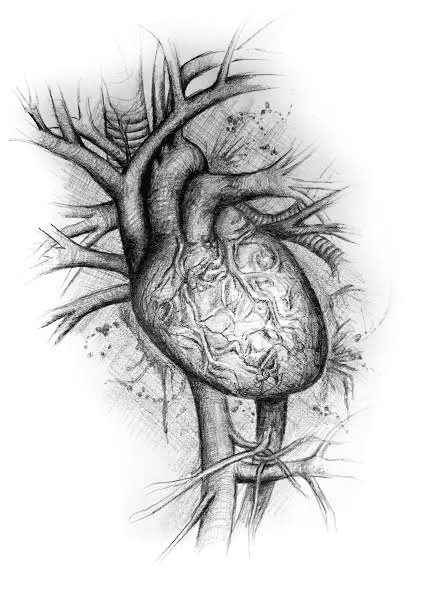 As seen in Figure 4, in CABG surgery, a blood vessel from another part of the body is harvested and used to redirect and restore blood flow to the muscles in the heart (Mullany 2003). Robot or no robot, up until now, this surgery has required cardiopulmonary bypass (CPB) a technique in which a machine will perform the functions of the heart while the heart is stopped so as to allow surgical intervention. However, naturally, stopping the heart does not come without major health complications including cognitive loss, which will induce increased time of hospitalization and costs. But is there an alternative to the CPB technique that induces the same results without the complications? The answer to this question is a resounding yes. In a study done in 2015, the implementation of a heart motion compensation system on the da Vinci robot for CABG was tested (Ruszkowski et al. 2015). The way the heart motion compensation system functioned was a component of the robot, known as the patient side manipulator (PSM), was programmed to track the trajectory of a beating heart by a spectral line controller, which was uniquely used in this experiment to control a robot to follow predicted heart trajectories. With these two adjustments to the da Vinci surgical robot, the trajectory of the heart could be tracked. What was also necessary was a stable picture provided to the user. To provide the surgeon with good picture, the camera used must be able to track the heart motion accurately so that it produces a virtually stabilized environment when, in actuality, the picture is anything but stationary. 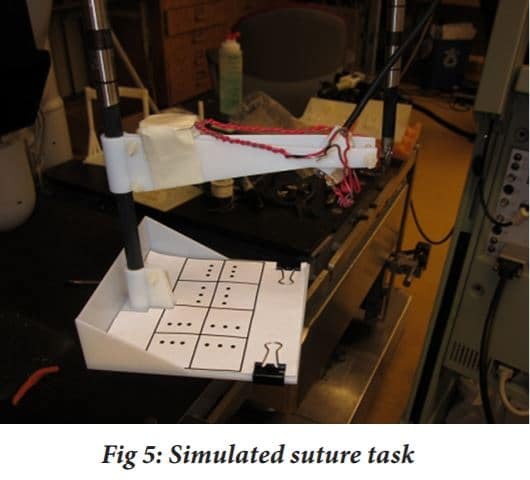 After these modifications were implemented, five surgeons were asked to complete a simulated suture task with 5 different conditions in which the task was completed. In the simulated suture task, a pin was used to pierce paper at a specific dot. This task simulated whether a suture can be placed in a desired location with precision. The five different conditions in which the task was completed were: when all targets were stationary, when there were moving targets with no motion compensation implemented, moving targets where motion compensation was activated, moving targets where motion compensation was used and with a smaller range of motion, and moving targets where compensation was enabled with a slower frequency of motion. 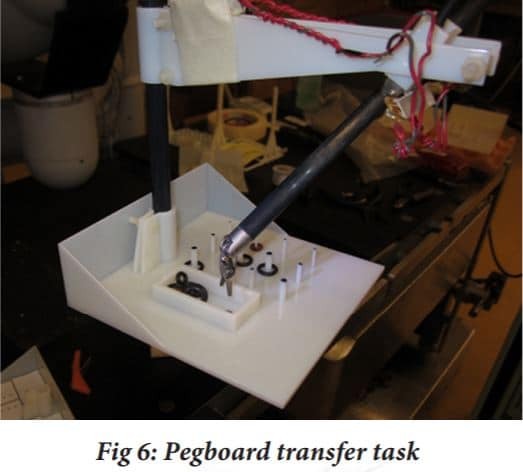 The results showed that as the targets were moving, the number of missed targets decreased from 37% when the da Vinci robot’s motion compensation mechanism was turned off to 13% when turned on. The percentage of targets that were hit increased from 26% to 41% and the completion time of the task decreased as well. Although the results of the experiment were not ideal enough to adopt the use of the heart motion compensation system in place of CPB during CABG surgery, the system’s initial results were very promising. Once the system can be used in place of CPB, the benefits will be far-reaching. Extremely minimal invasive surgery will be necessary to treat cardiovascular diseases, which will lead to immense decreases in health complications and decreased hospital stays for patients.